A beautifully machined piece of engineering, hand made from start to finish in the UK. Perfect for urban or polo use. Cut from a solid block of 6082 aluminium alloy. Constant diameter straight bar (solid) with domed ends, central knurling and laser engraving. Reassuringly hefty and a pleasure to handle. Available colours are anodized black and custom hand polished (see listing for 26.0mm below for illustration of black). NOTE: gold and silver anodized are now discontinued. Length of all bars is 38cm. This is a good all-round sensible width for traffic dodging while still retaining full control - remember your feet and pedals will be wider than this anyway. Constant diameter in two sizes to fit 25.4 stems or 26.4 classic Cinelli stems. See FAQ for more. 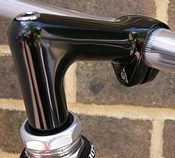 IMPORTANT: being constant diameter these bars need care in fitting to avoid scratches - please see the Blog article for fitting tips before installing these bars and ensure they will fit your stem - we cannot accept returns of scratched bars because the wrong size was forced in! Each bar is supplied with detailed fitting instructions. Brake levers that fit this bar include the Dirt Harry and Tektro Cross Top levers. Please see FAQ for handlebar info. Please note that traditionally polished items may tarnish over time due to weather, normal use etc and may require cleaning or re-polishing - we recommend 'Peek' (easily found on eBay). 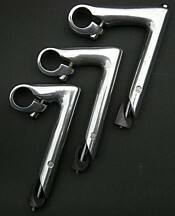 As above but in 26.0mm diameter to fit 'modern' stems including the 3TTT and various Nitto models below. Pair with the Nitto Technomic in 70mm for a fast steering upright 'urban' set-up. Available in black anodized or polished (gold anodized now discontinued) and in one length of 38cm. This is our very popular cut-down riser. Not being able to find a riser bar in the required width we take NOS mountain bike risers and reduce them to a more suitable narrow width for urban use of 40cm. Additional wider 50cm option now in stock. This gives more space for controls/grips and a wider position compared to the more urban 40cm. Ready to fit with grips of your choice (40cm is not usable with 'lock-on' type grips). These are professionally cut down by our UK engineers for a superb 'factory finish' with chamfered and machined ends inside and out. Finished in polished aluminium alloy or black. All bars have the VeloSolo logo laser engraved as with our Squeeze bars above. Rise is approximately 30mm with slightly swept back ends. Stiff and strong and ideal for commuting and city use. Fits any 25.4 stem or use a Nitto shim to fit to 26.0mm stem or a Zenith 25.4mm to 31.8mm shim for oversize stems. Please see FAQ for handlebar info. 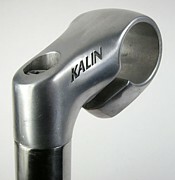 If you run a non-threaded fork the Woodman stem further down this page is ideal with these bars. Please see FAQ for handlebar info. 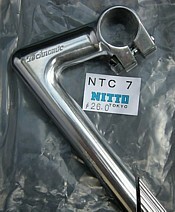 Classic super strong chromed steel track bar from Nitto. NJS certified for professional Keirin track use. Curving forward flat section and deep drop. Available with width of 38cm or 40cm centre to centre. Fits 25.4 stem or use Nitto shim to fit to 26.0mm stem. Made in Japan with beautiful bright chrome finish and good old 'brown paper' wrapping. Yes, Nitto make lighter weight aluminium alloy versions of this bar (email us if you want one) but there is just something about the incredibly solid feeling, deeply chromed, reliable steel heft of this bar that appeals. On pulling it out of the brown paper wrapping you will know what we mean. Please see FAQ for handlebar info. Exact same design as above but made from cro-mo steel for a slight weight advantage. NJS certified for professional Keirin track use. Curving forward flat section and deep drop. Available with width of 38cm or 40cm centre to centre. Fits 25.4 stem or use Nitto shim to fit to 26.0mm stem. Made in Japan with beautiful bright chrome finish and traditional paper wrapping (grey not brown). These are a brand new bar to VeloSolo and a lighter weight (265g) and more affordable alterrnative to our steel Nitto bars above. 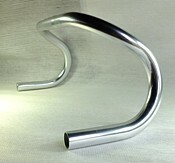 This is a very close copy of the Nitto 123 in the classic track bar shape with traditional curved drops. No grooves. Polished finish with no logos. Width is 41cm centre to centre (centre of drops) and 42cm at the base of the slightly flared out drops. Drop around 165mm. Stem fitting is 26.0mm. highly recommended. Please see FAQ for handlebar info. 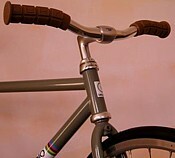 Slightly different form the normal Nitto drop bar shape but with a very popular cult following. 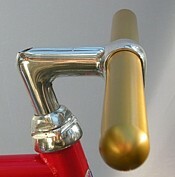 Originally designed by the Rivendell Bicycle Works in the US, these are made by Nitto in Japan. Instead of a completely straight top section these have a slight bend in the tops to provide a more comfortable upright position. It sounds odd but this subtle rearwards kink where your hands sit gives a more natural hand position and works great for city riding or just general use. Worth a Google search for more feedback. Drop is reasonably moderate at 135mm. Traditional shape with no grooves and rounded drops. Nitto have even used a very attractive classic style crest on the sleeved section. Two widths available of 40cm centre to centre (centre of drops), 41cm centre to centre at the slightly flared out ends or wider 42cm centre to centre. Fits 26.0mm stem. Made in Japan. Lightweight, good looking and well priced - highly recommended. Please see FAQ for handlebar info. 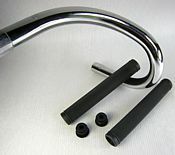 These are a classic 'old school' compact Italian drop bar shape; rounded not ergonomic, with a flat top section and no grooves for cables or similar. Perfect for a classic build. Model is the 420mm (not 400mm labeled in pics) Width is 41cm centre to centre (centre of drops) and 42cm at the base of the slightly flared out drops. Fits 25.4mm stem. Made in Japan. Lightweight, good looking (current stock has attractive 'Olympiade' crest) and well priced - highly recommended. Please see FAQ for handlebar info. 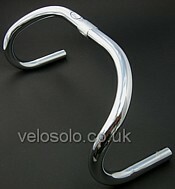 Another brand new bar to VeloSolo at a great price and a superb budget alternative to the Nitto bars above. A copy of the Nitto B115 this is a classic compact shape with traditional curved drops but with shallow grooves to upper section. Polished central section (bead blasted to remainder). No logos. Width*** is 40.5cm centre to centre (centre of drops) and 41.5cm at the base of the very slightly flared out drops. Drop approx 140mm. Weight is 355g. Options for 25.4mm** (see note below) or 26.0mm stem. Highly recommended. Please see FAQ for handlebar info. 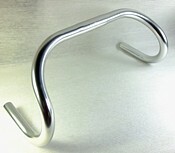 Another Nitto classic, the aluminium alloy bullhorn bar with up-turned ends. Probably the nicest bullhorn out there and a neat alternative to chopping down that old Cinelli bar in the shed. Available in two widths of 38cm or 40cm. Fits a 26.0mm stem. This is the high spec heat-treated and gun-metal grey anodized version. 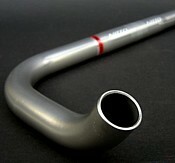 Nitto make a cheaper non-HT bullhorn too. Made in Japan with laser engraved Nitto markings. Works well with plug-in or cross-top type levers. A more affordable alternative to the Nitto above. A slightly 'squarer' design than the RB-018 with slightly longer 'horns' - easy to cut down if required. Available in one width of 40.5cm approx centre to centre. Fits a 26.0mm stem. Available in polished silver or black. Both with no logos or engraving. Works well with plug-in or cross-top type levers. A niche bar but a really useful one that has a faithful following especially amongst touring cyclists. These have a multitude (near infinite!) number of riding postions and with the ends at a different 'level' to the middle these can be mounted either way up and at various angles to suit personal preference. 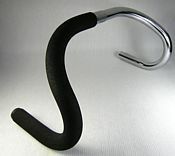 Google (images) for 'butterfly handlebar' to see the various ways this bar can be used. The Kalloy model is great value and a very close copy of the Modolo Yuma trekking bars. Available in polished silver or semi-gloss black. Both with no logos or engraving to main area. Available in one width of 570mm, this is a good commuting bar but being wide it is not really suited to serious traffic weaving. Usable with any 25.4mm stem. Best used with handlebar tape or ideal with one piece long foam grips (see Zenith foam grips lower down this page). Brake mounting area (middle or ends) is 22.2mm so any regular MTB brake levers can be used. A brand new bar from Zenith similar to the Noah's Arc from Soma. These give a similar riding postion to a very swept back flat bar but are fully curved for a unique look. Available in one width of 540mm (can be cut down). Fits a 25.4mm stem. Available in polished silver or black. Both with no logos or engraving. Use with any regular grips and any 22.2mm brake lever. 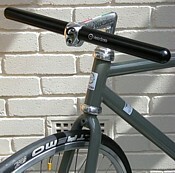 A bit different to the above bars - imagine a drop bar with the ends turned back up. Consequently quite wide but with a huge range of hand positions and very minimal drop. Sweeps forward quite a bit so keep the stem length shorter than normal. Heat-treated aluminium alloy with a 25.4mm clamp area. Now available in 26.0mm too. Satin finish, made in Japan. Note: 26.0mm is a special order item - there will be a delay between purchase and dispatch. Completely straight bar in aluminium alloy. Not quite as narrow or exclusive as our Squeeze bar but a very attractive bar from the big 'N'. Width is 50cm end to end with 25.4mm clamp area. Great for city or commuting use. Mountain bike flat bars (slightly swept back) from Kalloy in satin black or polished/satin silver (Kalloy seem to vary the finish on these between polished and satin - please email if a particular finish is required). 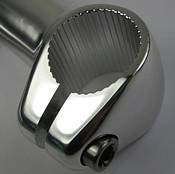 Clamp area is 25.4mm to fit MTB stems or use on a road/fixed bike with quill stem (see below). Un-branded (no logos) with gentle rear sweep around 5 degrees. Standard width is 560mm (22") but we are happy to cut these down to whichever custom width you require at no extra cost (min advised around 38cm). Please send a note when ordering. As with Andel and Surly cogs so it is with Zenith and Dia Compe - this is the exact same stem Zenith manufacture for Dia Compe but unbranded and logo free. Our most popular stem. Not having a GC logo makes it around £15 less and superb value. These are new to VeloSolo and fill the gap nicely between the Kalloy and Nitto stems. Quill height is 130mm with max extension of 62mm. Note: standard model in all sizes above has a 130mm quill with max extension of 63mm. A longer quill (180mm with max extension of 113mm) is now available in two options only; 25.4mm x 80mm black and 26.0 x 80mm polished. Please email to request these options or use 'send a message to seller' when checking out. Very popular stem, this version has a concealed style clamp bolt similar to a Cinelli XA. This is a very solid stem in forged and polished aluminium alloy with a 25.4mm clamp and a 150mm quill. Perfect match for our cut-down risers. 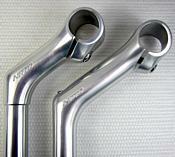 Also fits track bars including various Nitto models. Exact same stem as above but in new black powder-coated finish. Clamp is 25.4mm with the same 150mm quill. Perfect match for our cut-down risers. 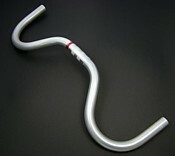 Also fits track bars including various Nitto models. This is a really useful stem and ideal when a very short, upright position is required. Excellent value forged aluminium alloy stem with stainless steel quill. An alternative to the Kalin above, this is a one piece forged 'swan neck' design. Taller extension allows around 1 inch (25mm) higher position of bars together with slightly more forward reach (50mm). Forged in one piece with 'polished' or new black finish. We are now stocking the Nitto Dirt Drop to offer a higher rise, shorter reach stem as per the Kalloy/Kalin models above but crucially with a 26.0mm bar fitting. Quill is 190mm with 130mm above the min insert line. Reach is minimum 80mm (100mm also available) but combined with the long quill and high rise angle (107 degrees) this provides a much taller, closer position than regular Nitto stems. Beautiful professional level forged stem from Nitto. Certified (NJS stamped) for professional level Keirin track racing in Japan. Angle is 58 deg so gives a very deep drop to the bars. Clamp size is 25.4 with a 22.2mm (standard 1") quill for threaded steerer. Length of 80mm or 90mm in polished finish and fitted with aluminium alloy wedge. Made in Japan. 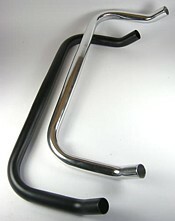 Attractive traditional forged stem with reliable nutted bolt to front. Combination of long quill (150mm with 85mm above the min insert) and short 50mm, 60mm, 70mm, 80mm, 90mm, 100mm or 110mm length makes this perfect for a more upright, controllable position on city bikes. 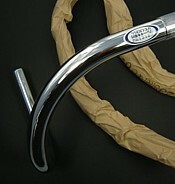 A good match for Squeeze bars or Nitto Bullhorns. Angle is 73 deg with a 22.2mm (standard 1") quill for threaded steerer. Polished finish and fitted with aluminium alloy wedge. Made in Japan. NOTE: 25.4mm clamp version also available to order - please email for more info. 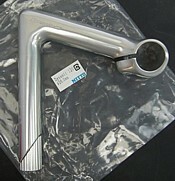 Excellent value forged stem from Nitto. Clamp is 26.0mm with quill at 22.2mm (standard 1") for threaded steerer. Polished finish and fitted with aluminium alloy wedge. Length is 120mm (not 110mm as shown in pics). Angle is 90 deg. 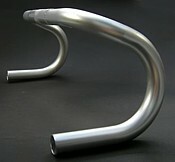 Another lovely forged 73 deg stem from Nitto. Superb machining and finish. Usual 22.2mm (standard 1") quill for threaded steerer. Available in large range of lengths from 80mm to 140mm with 26.0mm clamp or just the 130mm with 25.4mm clamp. Please email for other sizes not listed in drop down box. Polished finish and aluminium alloy wedge. Made in Japan. Angle is 73 deg. Perfect for running any 25.4mm bar (drops, flats, risers) on your fixed or singlespeed - especially popular with cut-down risers on a road bike in the city. Can also be used with 22.2mm BMX bars by adding a Zenith handlebar shim. Four bolt front mount gives a very solid and secure feel to the front end and allows easy swapping of bars. Equally suitable for off-road use on a singlespeed mountain bike. Very well finished with forged and machined construction. Length is 50mm with a 5 deg rise. Anodized black with Woodman logo. 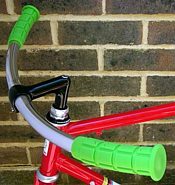 Superb lock-on grips available with various end clamp colours. Soft rubber main grip is 110mm long (total length 130mm) with anodized aluminium locking ends in black, silver, gold, red, blue, pink or green. Install and remove in an instant. 'File' type grip pattern similar to ODI Ruffians. Suitable for any bar with 22.2mm grip section (standard MTB etc). Designed for drops, these are long grips to fit around lower section of track bars. Alternatively slice off closed end to fit to curves, work well on bullhorn bars too. Available in black with grippy 'file' type pattern. Now in white too! Made in Japan. A new version of the traditional Soyo grips. Same length as above but these are a heavier duty type made of slightly thicker rubber with a more agressive file pattern. Available in black or white. Made in Japan. A fantastic value alternative to the Soyo grips above. These Zenith rubber grips are virtually identical in design to regular Soyos' but come with an open end and plugs included. Designed for drop bars but can be used on other style bars too. Available in black only with the same very grippy 'file' pattern as per Soyo. Please note: the plugs included are designed for thicker aluminium bars and will not be usable with steel/cro-mo Nitto drops. We recommend combining the grips with Velox plugs in this case. A one-piece extra long grip ideal for Kalloy 'Butterfly' bars, these are also well suited to Nitto drops and adaptable for use with other bars too. Closed cell foam (will not absorb moisture) in a relatively dense, thin style retaining plenty of 'feel'. These come complete with end plugs included. Total length of each grip is 42cm. The grips will cover virtually all of a drop bar and most of a Butterfly bar as shown. Available in black only. Please note: the plugs included are designed for thicker aluminium bars and will not be usable with steel/cro-mo Nitto drops. We recommend combining the grips with Velox plugs in this case. These grips can be tricky to fit! Ensure the bar is grease free and install with lots of hairspray or grip glue, and take time to work them on carefully (to avoid damage do not use tools etc or excessive force). Leave overnight to dry. These are the world famous USA Oury grips available in all the popular colours, perfect for flat or riser bars on and off-road. Genuine USA stock with hologram sticker in each pack. Large block pattern in durable but soft compound for maximum comfort. Suitable for any bar with 22.2mm grip section, perfect for our cut-down risers or any other flat or riser MTB or BMX bar. Available in black, white, grey, red, blue, green, orange, pink, purple, day-glo, 'Muddy Brown' (milk choc) and new yellow. 'Pastel Green' (Bianchi celeste), 'Chocolate Brown' (dark choc) & burgundy now discontinued. Difficult to get the colours accurate on screen but they are bold and bright in 'real life'. NOTE: colours are split into two lists. Premium Team Grips Black - NEW! A new grip and really versatile. The Team grip is ideal for all types of bars, it has a slim, soft but firm mushroom pattern - really comfortable in the hand but with a good feeling of control. It comes in a long 150mm length but is designed to be cut down to 125mm if desired with a pre-formed cutting ring. The grips come complete with durable end plugs although again as below these will not fit bars with really thick walls like our own cut down riser bars - fine with nearly all others though. Available in black only. 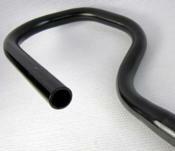 Suitable for any bar with 22.2mm grip section (standard MTB, BMX etc). A very affordable alternative to the real thing from Brooks and others, this is a synthetic leather look bar tape from Velo. Simple clean look, subtle 'grained' finish and no branding. Traditional style thin padding, includes chrome effect end plugs. Available in black or dark tan. 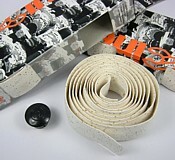 Three out of the ordinary styles of Cinelli's classic cork bar tape. 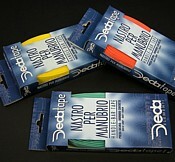 Choose from World Champion with rainbow stripes or Italian flag*, both with matching end plugs, finishing tape etc. Third type is the remarkable light emitting Lumen. This soaks up light and emits it in the dark, comes complete with relective end plugs. *Note: Italian now sold out and discontinued. Plain colous of Cinelli's classic cork bar tape. Choose from black or white. Embossed Cinelli logo. All complete with end plugs, finishing tape and extra pieces for brake levers. Made in Italy. Boxed with fitting instructions. Excellent quality cork ribbon from Silva available in black. Complete with end plugs and finishing tape. Made in Italy. Boxed with fitting instructions. 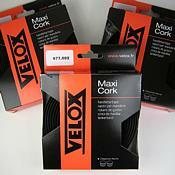 Great value plain cork tape in black from velox of France. Simple clean look with no branding and padded 'soft feel'. Includes chrome effect end plugs. Boxed with fitting instructions to rear. Another option in Italian cork tape. This one available in 'Bianchi' celeste or yellow or orange. Also standard black or white. Very comfortable 'soft feel' with Deda embossing and carbon look or chrome end plugs. Includes finishing tape. Made in Italy. Boxed with fitting instructions. 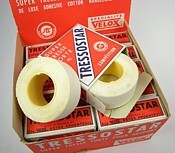 This is a more recent tape from Tressorex to compliment the classic black and white standard cloth tape below. This is slightly heavier duty and available in three different colours - grey, orange and brown (tan). New colour light blue now available. Price is per pair (two rolls needed for one set of drop bars). Made in France. Does not include end plugs. Legendary Velox cloth handlebar tape available in black or white. Price is per pair (two rolls needed for one set of drop bars). Made in France. Does not include end plugs. 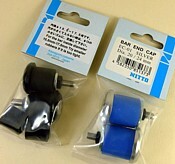 Nitto EC 01 and EC 02 Alloy End Plugs - NEW! 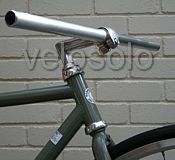 These are a new addition to VeloSolo and show typical Nitto high quality construction, finish and attention to detail. NOTE: please measure the internal size of your bars carefully as these will only fit the diameters given. Available in two different models - the EC 02 is supplied with two alternative rubbers and will fit any bar with a minimum 15mm to maximum 18mm internal diameter (including VeloSolo Riser bars, Zenith Crescent bars, Deda Dritto). The EC 01 fits thinner wall bars with a larger 20mm to maximum 21mm internal diameter (including Nitto Moustache, Noodle, Zenith Bullhorn & Track and Kalloy flat bars). Anodized aluminium alloy end with Nitto engraving, stainless steel allen key fitting and inner rubber expander. Available in black or silver. Price is per pair. Highly recommended. Very secure internal expander type. Excellent protection for the ends of your bars, easily removed and re-used without falling out like normal plugs! Sized to fit drop bars (minimum internal diameter is 20mm). Price is per pair. Note: these are genuine Velox plugs but Velox are no longer branding these with 'Velox' as per pictures. 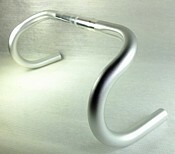 These are an attractive and hard wearing end plug in aluminium alloy and perfect for use with VeloSolo Riser Bars. Supplied with shims these will fit any bar with a minimum 15mm to approximately 20mm internal diameter - generally any flat or riser bar but not for use with drops or bullhorns (see Velox above). Designed to be used with 'endless' grips like the Premium but can also be used with taped bars. Available in black or silver. Price is per pair. 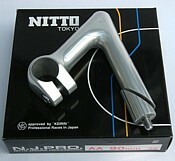 Note: now sold out and discontinued, please see Nitto plug above.